Soon you’ll be settled into your new home. Here are tips to make it a smoother transition for your pet family. Tip #1: Walk around your new home and yard to make sure your pet can’t get loose. For example, check doors, windows, basements, garage doors and fences. If your furry friend gets out in a strange place, it’s much easier to get lost. Tip #2: Check the yard to make sure there isn’t anything dangerous for your pet. Take care of any issues as soon as you find them. Tip #3: Make sure there are no pet odors from previous pets in the house. If the previous homeowners had pets, get your home thoroughly cleaned with an enzymatic cleaner to eliminate any pet odors. If your dog or cat smells another animal (for example, a spot where a dog or cat used to take naps), it’s possible your pet may want to mark those spots. There are companies you can hire to clean away pet odors. Just let them know animals have been in the house, and they’ll take care of it for you. Keep a bottle of enzymatic cleaner handy in case your pet starts marking spots or simply has an accident in your new surroundings. 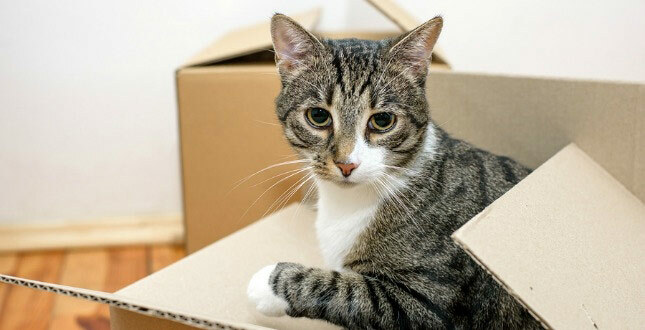 Tip #4: Find a safe, enclosed area (such as a bathroom) where you can put your pet on moving day. As we said in our last article, this will help keep your furry friend from getting loose when people are coming in and out of the house. Tip #5: Spend time with your pet and re-establish a routine. 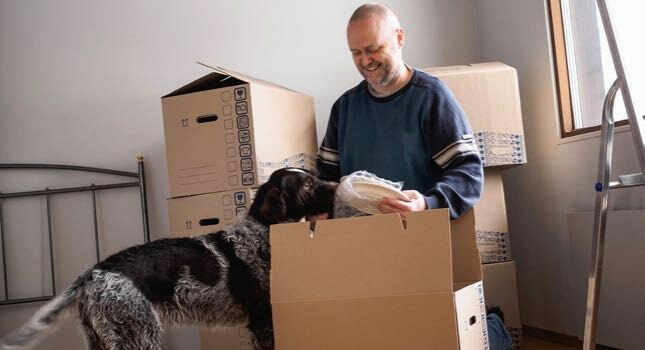 As hectic as the moving and unpacking process is, if you can spend some time with your pet, this will go a long way in easing your dog’s or cat’s stress. Get back into a normal routine as soon as you can. In addition, be conscious of whether you’re moving at 100 miles per hour. Pets feed off your energy, and all your activity can be stressful. Wait a week or two before you start going out and spending a lot of time away. Tip #6: Keep boxes in designated rooms with the doors closed. If you have a kitty, you know that boxes can be as alluring as catnip. Most cats can’t wait to get into them. While your new home is in a state of disruption from moving, you don’t want your little one to go missing in action in a box. Tip #7: Update your pet’s microchip registration with your new home address, and have your pet wear a collar with an identification tag. If your pet gets loose during or after your move, you want to make sure there’s a clear way for people to reach you. If you have an indoor cat that isn’t used to wearing a collar, we’re simply suggesting having your little one wear it for a few days (while there’s a lot of activity around your home). Tip #8: Have a plan if you can’t find your dog or cat. Check any boxes that may be in your home. Cats and small dogs can unexpectedly end up in them. If you think your pet may be outside, we suggest putting something outside your new home that has your smell or their smell on it. It can help bring your pet home. Tip #9: Expect a little anxiety. Don’t be surprised if your furry friend is a little anxious. It’s normal to take a few days for your dog or cat to get used to the new home. Spending time with your pet can help. Tip #10: Know that your dog or cat may not want to eat for a few days. It’s normal for dogs and cats to lose their appetites too. Dogs can go up to a week without eating (sometimes even longer). If you reach a point when it doesn’t seem right, call a veterinarian. Likewise, if your cat hasn’t eaten in two or three days, your kitty may have a liver issue. It’s time to call a veterinarian. Need a Castle Rock veterinarian? Tip #11: Be prepared for some unusual potty behavior. Your pet’s peeing and pooping behaviors may be a little thrown off for a few days. If your dog is used to always going potty in one spot, he can feel a little out of sorts in a new environment. In addition, some dogs don’t like to eliminate where other dogs have been. Long story short, it may take longer than normal for Fido to find a good spot to do his business. If your dog has an accident in your new home, take your dog outside, place his stool or urine outside where you’d like him and guide him to that spot. Dogs have a tendency to want to go in the same area where they can smell their scent. (If you aren’t able to take the stool or urine outside, simply show him where you’d like him to go.) Clean the accident spot well with enzymatic cleaner, so your dog doesn’t go back to it inside. Your cat may not want to use the litter box. Similar to our advice for families with dogs, if possible, place your cat’s stool or urine where you want your cat to go. Use enzyme cleaner on the accident spots to remove any odors that may tempt your cat back to those spots. There are studies that suggest it’s a good idea to have one more litter box than the total number of cats in your home. That way, your kitties have multiple places to go. If you haven’t done this before, start in your new home! Tip #13: Look for signs your cat is acting out. It could mean your new neighborhood has outdoor cats. You may need to do a little investigating to find out whether there are outdoor cats coming up to your windows and doors. Your cat may see or smell the other kitties. To help alter unwanted behaviors, you may want to put a cat repellant down outside the windows or doors. Clean up any accidents inside with an enzymatic cleaner, so your cat isn’t drawn back to that spot. It’s said that pheromone diffusers can help calm your cat. Pheromones are spread into the air in a dispenser similar to an air freshener. Outside of urgent health needs, you may not need to find a new veterinarian until it’s time for your pet’s next routine exam, vaccinations or teeth cleaning. If you have an older dog, we suggest looking for a new veterinarian within four to six months of your move. Older pets can get into trouble faster, and this way, you’ll have a go-to resource if you need help. Cherished Companions Animal Clinic is a veterinary clinic in Castle Rock, Colorado. Specializing in the care of cats and dogs, our goal is to help you and your pet feel more comfortable, keeping your stress to a minimum. Get tips, ideas and inspiration to help keep your furry friend healthy and happy. You'll get a new article in your inbox every few weeks. Our Castle Rock veterinary clinic is here to help you and your pets feel at ease. Here's to happy, healthy and comfortable pets! for cats and dogs adopted from rescue groups or local shelters within 14 days of adoption. for your cat or dog. Get details on these offers! What can I give my dog to calm him during thunderstorms and fireworks?